Despite the dominance of police brutality on in contemporary culture, this is nothing new. 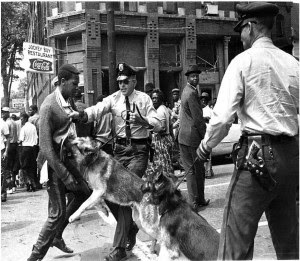 From the tossing of ill bodies and other bodies deemed unfit for labor being thrown from the slave ships to the dogs cast on the peaceful protestors of the civil rights movement, members of the majority have terrorized the black community for centuries. These unspeakable acts have attempted to discourage blacks, forcing them to concede to constructed subjugation. This post will examine some of the ways in which whites have attempted to violently sour the sweetness of black unity. Lynchings were one of the initial means to induce fear within the black community. 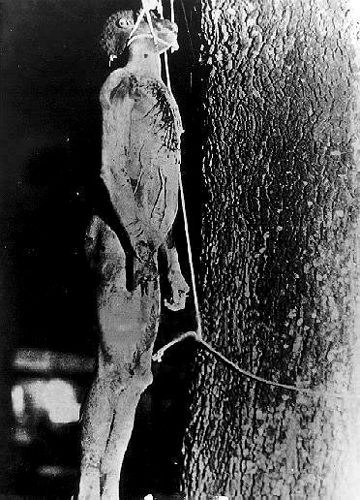 Lynchings were the act of hanging, often done in public and often resulting in the burning or public decomposition of the corpse. Despite the time lapse, lynchings mirror contemporary police brutality. Modern technology captures the element of spectacle seen in historical execution and mutilation of black bodies. As seen in the infamous Claude Neal and Emmett Till cases, black men were made into public spectacles due to their alleged interactions with white women. While these cases worked to discourage interracial contemplation, and establish black men as sexual aggressors that needed to be stopped, it also presented a fear on behalf of the white male towards the black male as a sexual competitor. Lynchings were often highly sexualized, as the castration of males was often performed before death was issued, confirming this anxiety. I would argue that contemporary violence against black youth employs a similar dynamic, shielding the white male anxiety with the facade of the black male as a monster. The element of spectacle, despite featuring the white male as an aggressor has largely been used to continually depict the black male as a problem and thus deserving of his fate. Thus, live footage of police wrongdoings, much like pictures and live hangings, fail to produce any serious consequences. The element of spectacle, while it should yield empathy, produces a visual devaluement to black bodies, just as lynchings did. For the black community the image of Emmett Till’s mutilated corpse is burned into our minds, as a reminder of just the fate that awaits each and every one of us at every corner. Emmett Till, like Trayvon, like Amadou, like Mike, like Ezell and countless other slain black youth represent the black community in its entirety. These young black victims of the twenty-first century are reflective of a society that has failed to change for their protection. Their deaths represent the reality of a stagnant state of being in the united States, and disable true progression where racism exists. Perhaps police brutality was at its height during the peaceful demonstrations of the civil rights movement. Although the demonstrations of the civil rights movement were often non-violent, peaceful protests were seen of violent intention to the white psyche. In a system of power that is and was largely dependent on the division of blacks, the unity was mentally unsettling to those of he majority. Neverless, police brutality on these peaceful protestors reflects a contemporary sentiment of indifference towards the reality of black resistance. America’s past depicts unarmed blacks being attacked by the police mirroring contemporary victims of the same offenders. While the police are certainly no angels, their actions mark the influence of their white collar counterparts. Police are the hands of a government controlled by those who mirror the implemented ideology of black inferiority. Police brutality is a governmental act of self defense by those whose self is solely based off the fallacy of black inferiority. If black strength was not a source of fear, there would be no need to maul peaceful protestors. If black strength was not a force to be reckoned with, then there would be no need to slay our leaders. Malcolm, Medgar, Martin, Fred, George, Jonathan-murdered in cold blood, out of fear that their influence would steer blacks from assimilation to cultural pride. Let us speak and act out against injustice, posing a non-violent threat to a country that threatens us. And because the only thing certain in life is death, let us die looking up at the sun that kissed us, and the sky that created us to conquer every fear inflicted upon us. Let the slain tokenize the price of freedom, and cure any fear of death. For if we must be fearful, let us fear a life on a knees, at the mercy of our oppressors. Great post! You don’t know how right you are! I have said the exact same thing many times myself. Thanks so much Antoinetta! I would certainly love his input! The Black community should be taught to love eachother and marry each other instead of dating outside their race on mass the way they do at the moment. But the older generation of Blacks have not been teaching that to the younger generations over the last 30 years. There is a good book which the creator of this channel should read. Its called “without sanctuary” by James Allen. It shows hundreds of pictures of Black men that were tortured with knives and then set on fire or lynched by angry white mobs after they were caught screwing white women. Its one of the most graphically horrific books ever published. As punishment for Black men screwing white women, these mobs would then break into the houses of the sisters and wives of the Black men that had been lynched. If any Blackwoman was found defending them the first thing they would do is check that she was pregnant. If she was pregnant they would drag her (and a couple of other Black females in the house) out screaming to a secluded location and tie her upside down on a tree by her ankles with ropes. They would take a massive knife and cut open her stomach. The newborn Baby would drop out and cry briefly whereupon the white women in the mob (whos faces by now were ecstatic with heightened joy) would rush forward with shreeks of delight and stamp on the babies head crushing its Brains all over the ground. It was a sadistic hobby. Before the civil rights movement its documented that certain white women who engaged in this sadistic ritual were given special elevated status by the rest of their fellow whites in a special “rites of passage ceremony” conducted by all the white elders of the area who visited after the unborn Black babies skull had been crushed and the open Brain matter displayed on the ground. But the problem soon became that whilst all white elders supported lynchings, they were not always present at all lynchings as they wanted to maintain their respectability in public. This led to some white elders requesting that any white women who wanted elevated status in the town through lynching participation, had to provide actual proof of the unborn Black babies skullcrushing once it had been cut out of the pregnant black womans stomach. This led to many white women rushing forward and rubbing their shoes in the babies open Brain matter on the ground after the unborn Babies skull had been crushed. They then showed their shoes with the open Brain matter on the sole wrapped in a paperbag to the white elders when they went back. But there wasnt enough crushed Brainmatter to go around. This in turn, led to some desperate white women fraudently claiming to have been involved. They ingeniously used body parts from dead animal carcasses out of their cooking pots and rubbed that on the soles of their shoes and showed that to the elders to prove that they had stamped on the Babies skull and crushed its Brains all over the ground. Some were exposed as fraudsters because they were simply and easily identified as NOT having been in the crowd by other real members of the crowd. Whilst the skullcrushing of the now “ripped out” unborn child was going on the remaining mob would then cut off the fingers of the Blackwoman who was at this point still screaming and writhing in pain, and put the fingers in alchohol to be pickled and preserved and used as trophies. This too was considered a special “rites of passage” for white women by high level whites at that time as the fingers, ears (and penises in the case of the Blackman) of Blacks were pickled in jars as trophies and souvenirs. Just type in google the “lynching of mary turner”. The other one was the lynching of luther holbert. It was a torturefest. In both cases the Blackwoman was tortured to death using the most excruciating proceedures alongside her husband. And dont forget, both these cases were actually documented by white people!